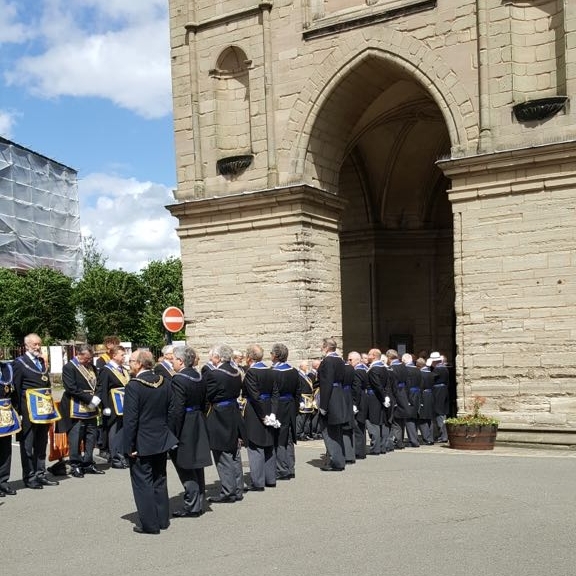 This is one of the major events in the Provincial calendar and the Provincial Grand Master considers every Worshipful Master, together with his Wardens and their families with other members of the Lodge, and their families should have the pleasure of attending. W Bro John M Cowan will lead the service and deliver the sermon, this year’s theme being “300 Years On – What Next?” Representatives of the Jewish, Sikh, Hindu and Muslim faiths, as well as Christian, will be taking part. The Director of Music is W Bro Peter H Summers, PGStB, Provincial Grand Organist, The Provincial Choir will be under the direction of W Bro Michael Irving PAGDC, while the Assistant Director of Music at St Mary’s, Mr Mark Swinton will be playing the organ. White Gloves and Royal Arch, Tercentenary and Festival Jewels only to be worn Brethren who are not in the procession will clothe after taking their seats. Seating arrangements will be indicated on admission tickets. Doors open at 2.00pm. Brethren with unreserved seats and their guests are requested to be seated no later than 2.30pm ready for pre-service music. Lunch is available at Alderson House and The Warwick Arms Hotel which is situated adjacent to Alderson House prior to the Service and will be 12.00 noon for 12.30pm at a cost of £25 per person, including wine. Early application is essential as places are limited and will be allocated on a ‘first come, first served’ basis. Please advise which venue you would prefer to lunch at although no guarantees can be made.